STATE SAVINGS BANK DETROIT 1915 photo picture print photography for sale. PEOPLES WAYNE COUNTY BANK Detroit old vintage photo picture print photography for sale. 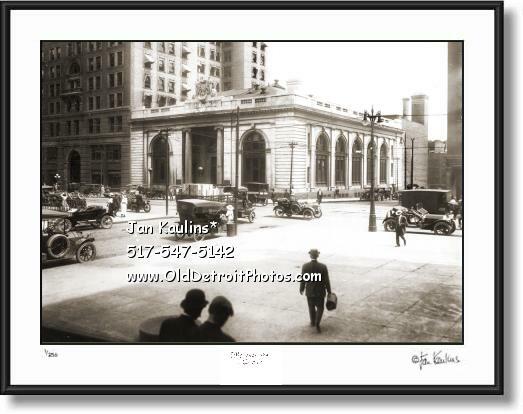 PEOPLES STATE SAVINGS BANK Detroit 1915 photo picture print photography for sale. This is a wonderful professionally restored STATE SAVINGS BANK photo print for sale showing this beautiful historic structure circa 1915 with the streets full of Model T vehicles and people in period dress. PEOPLES STATE BANK Detroit photo picture print photographs for sale. THE STATE SAVINGS BANK in Detroit was organized in 1883 and purchased the site at the corner of Fort and Shelby in 1898, by which time it was the largest bank in Detroit. They comissioned noted architect Standord White to design the Neo-Classic building. In 1907 The State Savings Bank merged with the People's Savings Bank to form the People's State Savings Bank. The State Savings Bank in Detroit merged in 1927 to become the Peoples Wayne County Bank, but disappeared during The Great Depression. The structure was listed on the National Register of Historic Places in 1982. THESE BLACK AND WHITE DETROIT PHOTO ART PRINTS ARE VERY HIGH QUALITY REPRODUCTIONS OF ORIGINAL OLD VINTAGE HISTORICAL DETROIT PHOTOGRAPHIC PRINTS. THESE SEPIA TONED BLACK AND WHITE DETROIT PHOTOS ARE OFFERED FOR SALE HERE FOR THE VERY FIRST TIME. THEY HAVE BEEN MADE FROM ORIGINAL NEGATIVES OR ORIGINAL FIRST GENERATION PRINTS, MANY OF THEM ARE 50 YEARS OLD AND SOME DATE TO THE EARLY 1920's AND 1930's. THE RARE OLD DETROIT ORIGINAL PHOTOS AND BLACK AND WHITE NEGATIVES USED FOR THESE PRINTS HAVE BEEN OBTAINED FROM HISTORICAL SOCIETIES, NATIONAL ARCHIVES, THE LIBRARY OF CONGRESS AND NUMEROUS PRIVATE COLLECTIONS. IT HAS TAKEN SEVERAL YEARS TO PUT THESE OFFERINGS TOGETHER ON THIS WEBSITE. MANY OF THESE PHOTOS ORIGINALLY CAME FROM OLD DEFUNCT NEWSPAPER AND MAGAZINE ARCHIVES, WHERE THEY WERE USED ONCE FOR A STORY AND THEN USUALLY JUST THIS ONE ORIGINAL PRINT WAS MADE AND KEPT FOR THEIR ARCHIVES. HENCE, THESE HISTORICAL IMAGES WERE NOT ORIGINALLY MADE TO BE FOR SALE, BUT WERE TO BE USED AS IMAGES FOR NEWS STORIES AS THEY UNFOLDED--MAKING THESE IMAGES EXTREMELY RARE HAVING SURVIVED SO MANY YEARS. VERY FEW OF THESE IMAGES HAVE EVER BEEN OFFERED FOR SALE TO THE PUBLIC UNTIL NOW.